This is the first post of my new blog at my website, so it truly is a new beginning using an entirely new system. There are lots of neat options, I just need to figure out how to use them all. The only way to learn is to jump in and start. I am also writing this on New Year’s Eve day, with a brand new year starting tomorrow. 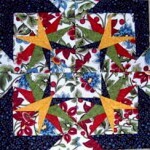 The block above was made by Mary D. from the Carol Doak Yahoo Group. I started a Block of the Month for the group last September, so the beginning of the month means a new block is uploaded for the group. Members make the blocks using their creative ideas and upload their pictures. 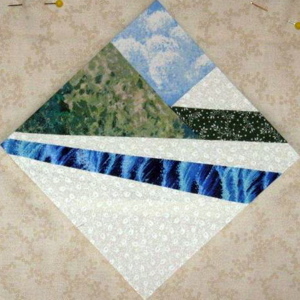 Each block represents a scene and living in New Hampshire, a snow-covered mountain scene is perfect. 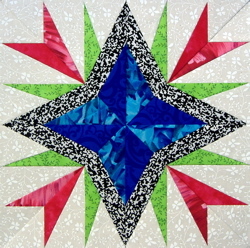 This block is also a pretty plain block so it offers lots of creative options for embellishment. I started the practice of uploading a Celebration Block each time we hit a milestone membership. Well, we just reach 4500 Members!!! Trust me, when I started this group a couple of years ago, I had no clue it would grow so quickly to thousands of members from around the world. I just uploaded a couple of days ago, our 4500 Member Celebration Block. I provide the design and the members provide the creativity as no fabric or color suggestions are given. This block was made by Karen. I will show more of these blocks in future blogs. I am also beginning my 2009 travel schedule. I leave next week for Texas and then am home just a few days before heading to New Zealand for a couple of weeks. 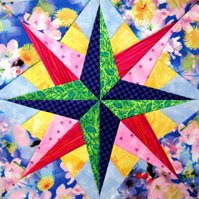 I will be helping Beth Hayes lead a group of quilters on this exciting and fun trip. I have traveled to New Zealand to teach many years ago, so I am looking forward to returning to this lovely island. When I wrote the Mariner’s Compass Stars book, I named each of the blocks in the book for different countries and areas of the world. When I designed the New Zealand block I was reminded of the beautiful gardens represented by the reds and pinks, the color of the water in the harbors, the gorgeous green and snow-capped mountains. Speaking of snow, we got several more inches yesterday. Heading south is looking really good. This entry was posted on Thursday, January 1st, 2009 at 12:13 pm and is filed under Carol Doak Yahoo Group. You can follow any responses to this entry through the RSS 2.0 feed. Both comments and pings are currently closed.